When winter comes to Colorado and you want to still enjoy the outdoors having the right gear is very important. Some of the best gloves I have used to date are the ones in this review. Normally I use a very light weight North Face glove for almost everything, however I have recently picked up these Ergo Grips from Hestra and will never look back. Below is some history of Hestra. Upper section made of windproof and breathable Gore WINDSTOPPER© Breeze. The key feature on these gloves is by far the “Ergo Grip.” At first I thought this feature was not needed as I had never had gloves that were shaped to hold items easier and never felt like I needed. After using the gloves for a couple months now I am in love. The gloves hold a pre-curved shaped to allow your fingers to actively grip items with ease. 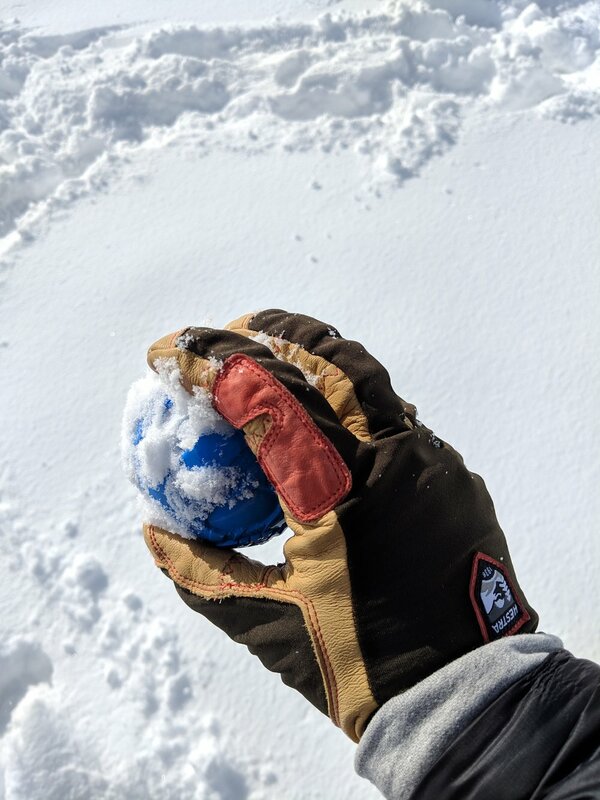 Even when bringing these gloves down to the park on a snowy winter day, I had found the gloves to preform perfectly while throwing the ball for Breck to fetch. The Goat leather used on the palm of the glove has broken in nicely and now even moves better than before. The leather is soft yet gives a surprising amount of grip as well. Ever stich on the Ergo is in line and feels perfectly placed. The craftsmanship on the glove is truly amazing. The outside of the glove is made with a breathable but Windproof Gore-Tex lining and feels like a good compliment to the goat leather palm of the glove. It allows for great movement and space for the knuckles to move as well. The Ergo grip is not fully waterproof which is somewhat of a downside, for that you will have to spend another $60 for the Ergo Grip Outdry. I opted for the normal version because if I needed anything more heavy duty and waterproof I would move up to my Hunters Gauntlet CZone. For what I have used the Ergo Grip for the wind proof lining has been plenty to keep my hands dry and warm. I had used them one time while building a snowman and after about an hour of picking up heavy, wet snow my hands started to get wet. If you really need a fully waterproof glove I suggest upgrading to the Outdry version. The gloves secure with a Velcro strap and a stretch collar for easy on and off. Using the Velcro was very easy and it gives a great feel when strapped up. The gloves not only preform well but they look the part as well. I like the looks as I feel it blends the line of a functional but fashionable look with the tan palm. Overall, I think the Ergo Grip Active glove from Hestra is by far my favorite do-everything glove. It moves like a dream and is lightweight enough to wear almost anywhere. The windproof lining does an amazing job keeping the cold air out and as long as you’re moving and not messing with water your hands will stay warm and dry. The gloves come in at $110 which is not cheap but I believe to be an amazing deal for this nice of a product. I will be looking to get more gloves from Hestra in the future. Hammock vs Tent: Which One is Better for Camping?